Telegraphy from the Greek words tele = far and grahein = write, is the long distance transmission of messages electronically, eventually involving the use of Morse Code. 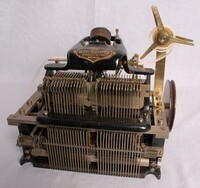 Early Morse key, not dated but marked Marconi. By its shape and size similar to keys fitted to large ships after 1910. Morse sending and receiving station. 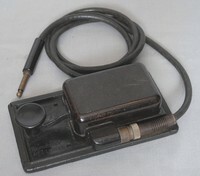 On the side of the unit (out of view) is a standard P.O jack No8 for Telephone plug No406, possibly for a headset, or even a telephone line. May have been used by the Military although not marked as such. Known as a 'Bugs' key and originally developed as the 'Vibroplex' or semi automatic key. The word Bug comes from a telegraphers insult to those who were poor at the craft. A common problem with telegraphers was an affliction known as 'Glass arm' or 'Telegraphers paralysis' caused by repetitive strain, this type of key was to help sufferers but originally was too slow (pre Vibroplex), however with future designs this problem was overcome and eventually keys of this type were being sold as 'Speed keys'. Bought as a toy for youngsters and adults to learn or practice Morse. also provided was a lamp for sending signals without any wires. Used on the high voltage portion of circuitry in a transmitter, therefore the unit is fully enclosed to protect the operator. 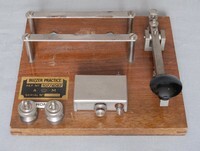 Either a toy for learning Morse or simply a training aid, it could be used as a simple local sounder, or connected to a line with another remote unit. Key known as a 'speed' key, the familiar shape had nothing to do with increasing the operator speed, just a selling point. 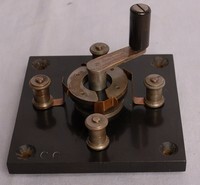 Morse key for use with the Larkspur range of Transceivers made by Pye after WW2. The bulb with this key can be used for training by sending without the need for wires. Made for training amateur radio enthusiasts. Not to be considered as a toy more a training aid. 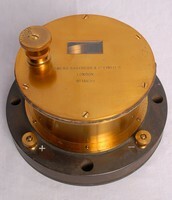 A small Galvanometer in the centre was used for indicating the direction of the message. More than one station like this can be connected, all the units receiving the same message, the needle will indicate where the message originated, Up line or Down line (Rail terminology). See the history of telegraphy. The name 'speed' is loosely used and in fact this style of key is not a 'speed' Key . It was common for manufacturers to abuse the name which refers to a totally different type of key. This item made in Japan. See item A0250. and A0724. 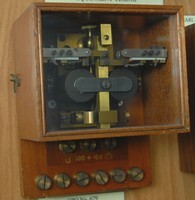 The Relay was used in telegraphy for amplifying the power. The coil is energized by a very small amount of power which activates a contact moving larger locally supplied power. This relay is more sensitive to vibrating at high speeds than other P.O. Relays. It achieves this by overcoming delays in movement due to residual magnetism. Up to 200 words per minute is possible using this relay, the average rate of transmission was improved by 50% by fitting these relays on Duplex Systems, see item A0253. Recognised by the letter �G�or the name itself. 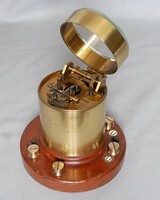 Suitable for a single needle telegraph or double plate sounder. For types of P. O. relays see A0252. Relay used in telegraphy acting as a form of amplifier for the signal, sensitive coils moved the contacts which controlled equipment that could be powered locally. This relay replaced earlier forms known as �A� having coils of 100 ohms instead of 200 and being shorter in length. Relay �B� also sometimes having differential coils (two winding on each coil) It can be of the polarised (see item A0239) or non polarised type the polarised version has a magnet and can be neutralised, as in use with the double plate sounder item A0227, provided it has double throw contacts, which means the pole or tongue �T� is held between M(mark) and S(space) contacts. The relay shown only has a single throw contact, and is not polarised (no Magnet). Odd version marked as 'B' but more like a 'D' relay, for information on Telegraphy relays see item A0252. it has a single throw contact is non polarised (no magnet) has only one coil, with no other markings. Used in telegraphy systems to amplify power and and enable equipment to be powered locally. Post Office Relay �G� on a pluggable base. The �G� Relay is a later model of the Gulstad Relay see item A0238. It works best in Duplex Systems. �Duplex working consists in the simultaneous transmission of two messages in opposite directions over a single wire connecting two stations �(sic) P249 Telegraphy T.E. Herbert 1906 see item A0252 for types of telegraphy relays. Suitable for use on a single needle telegraph or double plate sounder.It has double throw contacts and is polarised, (has a magnet). This relay replaced earlier forms known as �A� having coils of 100 ohms instead of 200 and being shorter in length. Relay �B� also sometimes having differential coils (two winding on each coil) It can be of the polarised (see item A0239) or non polarised type the polarised version has a magnet and can be neutralised, as in use with the double plate sounder item A0227, provided it has double throw contacts, which means the pole or tongue �T� held between M(mark) and S(space) contacts. The relay shown only has a single throw contact, and is not polarised (no Magnet). �A� Relay earlier version of relay �B�. �B� Relay can be polarised or none polarised. With differential coils. And single or double throw contacts. �D� Relay not polarised and does not have differential coils. (Much cheaper). Used in Telegraphy to amplify the power lost on long cables, by activating a sensitive coil which moves contacts that operate equipment powered locally. Post Office Standard Relay �B� taller version. This relay replaced earlier forms known as �A� having coils of 100 ohms instead of 200 and being shorter in length. Relay �B� also having differential coils (two winding on each coil) It can be of the polarised (see item A0239) or non polarised type the polarised version (taller) has a magnet and can be neutralised as in use with the double plate sounder item A0227, provided it has double throw contacts, which means the pole or tongue �T� held between M(mark) and S(space) contacts. The relay shown has a single throw contact. and is polarised (Has a magnet). See item A0252 for types of telegraphy relays. 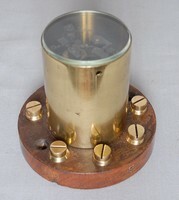 Hermetically sealed (watertight) Large Telegraphy Relay in Brass container. Relay used for reversing polarity of lines, made from an old Morse sounder. Originally sold at the BT museum auction . 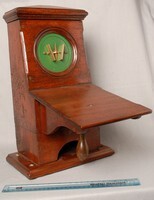 The ABC telegraph was an early form of communication where an arm was turned to a letter sometimes by a pulse, and sometimes by buttons opposite each letter, the arm being held by a return spring and latched on the letter required, a button was pressed releasing the arm which returned back to the beginning sending a number of pulses relating to the letter chosen i.e. the letter C would give 3 pulses the letter B would produce 2 pulses. The receiving unit would be driven by an internal solenoid counting the arm up to the required letter, after each letter was sent it was necessary to reset the unit and start again, sometimes this was achieved automatically. Such units were used while Morse code was being devised, around the 1840's, and continued in some countries long afterwards. This unit was simply a testing device for checking received signals only. The printer used Baudot's 5 bit code, using five telephone lines, to receive a signal that could be printed on a strip of paper. It was all driven by an electric motor. On receipt of a start signal the five bit code would latch five solenoids that would enable the mechanism to print a character by turning the wheel and engaging the correct letter. After printing a character the solenoids released ready for the next one. Designed by M.Carpentier and known as a 'Rapide' Receiver. This machine has been converted to a Teleprinter from the famous No5 machine, hence no keyboard. Instead are 5 solenoids with linkages to decode the 5 bit code into text. The whole machine is driven by a pulley connected to an electric motor (not present). The 5 was one of the first truly portable typewriters with a full keyboard. Punch tape reader for five bit Baudot coded tape, as the tape is pulled through the trough five fingers are able to move upwards into the holes in the tape, contacts inside the unit detect this and pass on the information to other equipment. In the early days of Morse all railway stations were equipped with the new morse code technology. Hearing the clatter of a Morse receiver, known as a sounder, could be a problem in a noisy environment. A gentleman called Charles Bright invented 'Bright's Bells' in 1855, a crude version of the exampe shown here. The double plate sounder has two solenoids and clappers hitting two plates of differing tones. By placing it in a hood the audibility of the dots and dashes would be greatly improved. Also provided is a relay which enables the unit to be powered locally, removing the problem of the loss of power over long telegraph wires. Charles Tilson Bright (later Sir Charles Bright) was to become one of Britain's foremost telegraph engineers in the nineteenth century, responsible for major advances in submarine cable technology. Morse Inker for recording dots and dashes on a strip of paper. This unit can be started automatically and then stopped at the end of the message, however as it is powered by a clockwork motor to drive the paper forward it would still need constant attention. Known as a Direct Inker ( does not include key or Wheatstone needle ). A simple Morse Sounder used for receiving Morse. 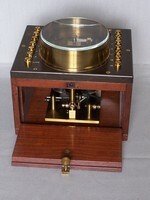 It may have been made by Gamage who specialized in telegraphy equipment in the 1920's. Non polarized unit similar to a design used by the Post Office and purchased by those who wished to learn the 'Art' of Morse telegraphy. And indeed it was an art. Morse code requires very high skills, strange that when it became adopted as a standard for communication by Samuel Morse in 1844 many other simpler forms of sending characters by wire were being developed, and yet Morse surpassed them all, probably because of the desire to improve or own a skill that others could not achieve, in today's world skills are avoided by modern computing. It was possible for the operator to distinguish whether the arm of the unit was up or down, by the different sound as the spaces between the dot or dash identified the end of a character, spaces between words could also be given as larger gaps, but most skilled operators omit this and join all the words up, making it important to write down what is heard immediately to avoid confusion. 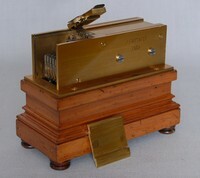 Receiving instrument for Morse code, invented by CC Vyle in the late 1800's and in use until the 1960's. A bar (armature) is moved between two stops, pulled down by a permanent magnet positioned underneath the cores of two coils; offsetting this force is an adjustable spring pulling the armature upwards. If the coils are energised by a positive current it assists the magnet and pulls the armature down. A reverse current defeats the magnetic force and allows the armature to rise. The same principal is used in polarised relays. The device can be adjusted such that the tension will allow the bar to stick on the bottom stop until a reverse current is applied. Adjusting the spring can also vary the current needed to operate the armature, this is useful in certain applications. The sounder's advantage lies in its sensitivity, requiring very low current to move the bar (armature), normally a positive current would give a dot or a dash and a negative current a space. Non Polarised Sounders do not have a magnet. Devices for sending and receiving intelligent information were needed to inprove communication on the railways. 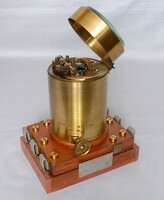 One such piece of apparatus was the Needle Telegraph, devised by William Fothergill Cooke and Charles Wheatstone, in 1936, from an idea by Baron Pawel Schilling, demonstrated around 1832. Information could be read if a needle was moved to the left or right, on this model the movement can also be heard hitting the plates on either side giving different tones. The single needle unit was a further development of Wheatstone and Cookes 5 needle system, which did not use Morse Code, and was replaced by the single needle system, which would be used in signal boxes around the World for the next 100 years. Information can be read if a needle is moved to the left or right. The single needle unit was a further development of Wheatstone and Cookes 5 needle system, which did not use Morse Code, and was replaced by the single needle system. This unit is clearly marked with the complete alphabet in Morse code on its face, and was probably used by the British Post Office. Morse inker which transferred Morse Code into dots and dashes printed onto a strip of paper. Driven by a clockwork mechanism to drive the paper forward. This unit was used by the R.A.F. between the wars. Known also as a Local Inker ( when it does not include key or galvanometer ). 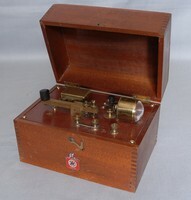 Receiving instrument for Morse code, invented by CC Vyle in the late 1800�s and was in use until the 1960�s. A bar (armature) is moved between two stops, pulled down the cores of two coils, offsetting this force is an adjustable spring pulling the armature upwards. If the coils are energised by a current it pulls the armature down. Adjusting the spring can also vary the current needed to operate the armature, normally a positive current would give a dot or dash and no current a space. Non Polarised Sounders do not have a magnet. Frederick George Creed was born in Canada and spent the early part of his life working on Morse equipment. He was convinced he could do better. He then moved to Scotland and developed a method of sending messages by text. Later he formed Creed and Company Ltd, and in 1921 they were at Telegraph House East Croydon. The 7E series of machines used a code based on the Murray code; they were very successful and were used throughout the war at places like Bletchley Park. Creed died in 1957. The 7 series finished in 1958 and this unit was converted to 240 volts AC in 1962.
breaking teams at Bletchley Park in Buckinghamshire. 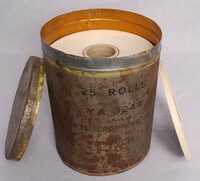 Paper tape used in telegraphy machines, such as the Creed 47B item NoA0098. Not to be confused with punch tape, the paper is too narrow for this, the gum is used to stick it to the Telegram sheet. As it says on the tin! 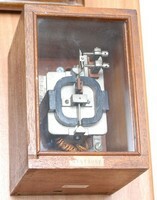 GPO engineers Tangent Galvanometer in leather case Type No 83 maker unknown. Used to detect current in either direction in Telegraph circuits on receiving or sending stations. Also used as test equipment and known as a differential type. Made at the Telegraph Works Silvertown. Used to detect current in either direction in telegraph circuits on receiving or sending stations. In Differential mode two coils deflect the needle left or right; if the current through both coils is equal then the needle will remain central. Also used as a piece of test equipment. 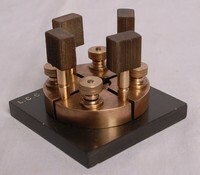 Used for indication of signal direction ( Current ) in telegraphy systems also as a test instrument. Used to detect current in either direction in telegraphy systems. Used as either a piece of test equipment or to send or receive Morse. The needle could deflect either left or right dependent on the direction of the current,or could measure the strength of the current by the deflection measured in degrees. 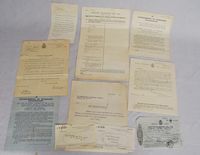 Paperwork relating to an application for a wireless license in 1923 under the Telegraphy Act of 1904 it was necessary to have a license to receive wireless messages by Telegraphy and a separate licence to transmit telegraphy messages. Francis Leslie Freeland was under 21 in April 1923 so his father had to apply on his behalf J.H.Freeland. The licence obtained was for the reception of telegraphy signals and also to experiment with equipment of his own. The Aerial had to be no more than 100 feet high and no more than 100 feet long; the use of a heterodyne oscillator directly connected to the aerial was not permissible between the hours of 9PM and 11PM weekdays and Sundays and not between the wavelengths of 300 to 500 metres. 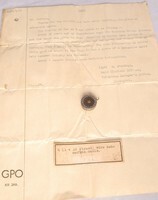 Also supplied at the time by the Controller and Accountant General Mr H.N. Bunbury of the General Post office was an application form for transmitting equipment. This does not appear to have been used. Removed from the South Western House Hotel, built in 1830, by Peter Silett a radio engineer for Radio Solent. Identified as a telegraph relay, however the three contacts are too large for Telegraph Transmission, and it may have been used in a supervisory mode such as power control. 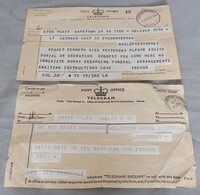 Two examples of machine printed tape on Telegrams. See Item A0098 in Sounders and Stations section. Single core Telegraphy cable with steel armour for under ground use. Insulation may be Gutta Percha. Early under ground or under water telegraphy cable. Insulation may be Gutta Percha. Gutta percha was obtained from a variety of guttiferous trees throughout the Pacific Rim although different varieties produce materials of differing quality. The differences generally reflect the quantity of resin in the product with that from Pahang having the lowest resin content. Balata has one of the highest resin contents and was obtained from trees in the tropical regions of South America. There is much confusion in the literature, and amongst collectors, as to �what gutta percha is�. In practical terms, and when addressing collectors� items, the material is probably the whole residue from the latex, dried after collection from whichever tree was its source. This material tends to range from dark yellow through red to black. It is possible that it has undergone some degree of purification but, given the variations in initial composition, it would be extremely difficult to confirm this, even by detailed chemical analysis. The transatlantic telegraph cable was the first cable used for telegraph communications laid across the floor of the Atlantic Ocean. It crossed from the Telegraph Field, Foilhommerum Bay, Valentia Island, in western Ireland to Heart's Content in eastern Newfoundland. The transatlantic cable bridged North America and Europe, and expedited communication between the two. Whereas it would normally take at least ten days to deliver a message by ship, it now took a matter of minutes by telegraph. Five attempts to lay it were made over a nine-year period�in 1857, two in 1858, in 1865, and in 1866�before lasting connections were finally achieved by the SS Great Eastern captained by Sir James Anderson with the 1866 cable and the repaired 1865 cable. Additional cables were laid between Foilhommerum and Heart's Content in 1873, 1874, 1880 and 1894. By the end of the 19th century, British-, French-, German- and American-owned cables linked Europe and North America in a sophisticated web of telegraphic communications. A card Attached Reads: "A scrap- the centre portion of the first Atlantic Cable ever thought to be laid and this was I believe ?? ?in laying of common coatingsand coverings wre used - bringing the full cable up to a large size= but this shows the wires.C.E.N. has kept this from about the time of laying - but which year- cannot now say." C.E.N. refers to C.E.Neate who died in 1907 and was Mr H.G.W. Reilly's Grandfather. Donated by H.G.W.O'Reilly ITT Business Systems - Private Communications Division Maidstone Sidcup Kent. The first radio transmissions were made using a spark transmitter and a receiver known as a �Coherer�. In 1890 Edouard Branley found that if high frequency oscillating currents were passed through a series of metal fillings in a glass tube, the fillings tended to coherer and become more conducting. Without the influence of the radio frequency currents, the fillings passed very little current. The coherer was a primitive form of radio signal detector used in the late nineteenth and early twentieth centuries, consisting of a capsule of metal filings in the space between two electrodes. It was a key enabling technology for radio, and was the first device used to detect radio signals in practical spark gap transmitter wireless telegraphy. Its operation is based upon the large resistance offered to the passage of electric current by loose metal filings being decreased under the influence of radio frequency alternating current. 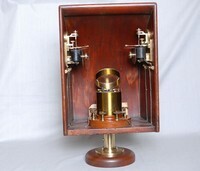 The coherer became the basis for radio reception around 1900, and remained in widespread use for about ten years. The coherer saw commercial use again in the mid 20th century in a few primitive radio-controlled toys that used spark-gap transmitter controllers. Polarity reversing key known as a "Commutator Key". Used with Double plate sounder item A0227 and Wheatstone needle item A0228. 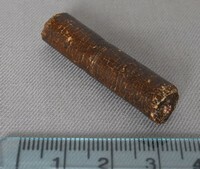 Early armour protected cable for under ground use. Insulation may be Gutta Percha. Gutta percha was obtained from a variety of guttiferous trees throughout the Pacific Rim although different varieties produce materials of differing quality. The differences generally reflect the quantity of resin in the product with that from Pahang having the lowest resin content. Balata has one of the highest resin contents and was obtained from trees in the tropical regions of South America. Telegraphy cable heavily armoured and further protected with layers of hemp saturated in a water proof compound, for under sea use. It is possible of course that this could have been used for Telephony. 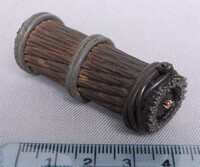 Early Telephone or Telegraphy cable possibly for under sea use. The insulation may be Gutta Percha. The Brass bands hold the sample together. Early method of switching circuits using removable pegs. Probably for bench testing in the Telegraphy or Electronics industry. School Laboratory Switch supplied by Griffin & George for Universities and Colleges.